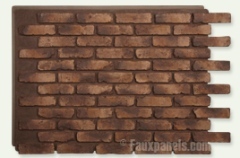 Faux panels are a type of siding designed to look like brick or stone or wood. The word "faux" is pronounced "foe", a French word meaning "fake". It is actually a polyurethane (or similar) product made from molds which were formed off of real brick and stone and wood. It is a very good product, and in some cases may make more sense than installing real brick or stone. This article takes a look at the advantages and disadvantages and when it may make sense to use faux panels. One of Fauxpanels.com's many panels. The panels interlock, and it is nearly impossible to find the seams once installed. In my earlier articles I looked at real brick walls and thin brick veneer siding. This is a continuation of that series. In the first case real bricks were used. In the second sections of bricks cut thin were used. With faux panels we forego the real bricks and go for something that looks like brick. Why would we do this? First, the faux panels are easy to install. They are easy enough for the DIY-er. Second, they provide better insulation than brick veneer siding, and about the same as a full brick wall, though none of these systems are sufficient in themselves to keep a house warm (or cold). They provide an R-value of 5 on top of whatever R-value the rest of your wall system provides. Third, I can not think of a third reason. If one of the top two doesn’t do it for you, go with the real thing or find another siding option. Before I go any further on this subject let me say a word about our sponsor. I have an affiliate ad on here for a company called FauxPanels.com, and another for a competitor called TexturePlus.com. That means if you click on either ad and buy their product I get a commission. I like that. Chances are you will also see a second ad for FauxPanels.com. I place Google Ad Sense ads in my articles and off to the side. Advertisers bid for the right to place their ad on my article. If someone clicks on an ad I get a few cents, or possibly a few dollars. I have no control over what goes in these ads but it is highly likely that FauxPanels.com will be the top bidder for this ad space. They are one of the top advertisers on the internet in the field of house siding. Chances are you have seen their ad many times already on many other websites. That said, I think you will quickly realize that this article is not an advertisement. I am giving my honest opinion, and encouraging you to consider your options. Of course, if you do decide to buy from FauxPanels.com or Textureplus.com, then get to their web page from my affiliate link. After all I have kids to feed, and one in college, and a mortgage to pay, and my car just died, and I’m an orphan. Okay, I’m not an orphan (sorry mom). That part was just a shameless effort to get your business. So, let us consider what you are getting with faux panels. The material is polyurethane. It is a polymer. That means plastic. It is a light plastic, because it starts out as a foam. That foam hardens but gases and air remain in the plastic. That entrapped gas is what provides its insulation properties. They inject this foam into a mold that was itself created from a real brick (or stone) wall section. The foam fills the mold and takes the shape of the bricks. When the foam hardens it is removed from the mold and then painted. The finished product will look like a section of brick wall, and the panels will fit together a little like a jigsaw puzzle. What little seam there is will be covered up with a rubbery mortar that you inject along the joint. While it will look like brick it won’t quite feel like brick. Rubbing your hand along the surface you can feel the difference. If you knock on an installed panel you will also be able to hear the difference. If this is going to bother you don’t get this product. Generally, most people just look at houses, but if you have visitors who like to run their hands along your walls, and entertain themselves by knocking on walls, they will probably figure out that it is not real brick. Otherwise you are safe. I once asked a guy where he got the wood for his log cabin out building. I was shocked when he told me it was polyurethane. It wasn’t until I actually knocked on the wood that I was sure he wasn’t pulling my leg. This stuff is good. Real good. Polyurethane will not expand as the temperature warms. That means it can be fastened securely to the walls. Vinyl siding is nailed loosely in little tracks that allow the siding to expand and contract, sliding past the nails. That is why the siding has to overlap so much. Polyurethane doesn’t have this problem. In fact, it is slightly elastomeric. That means if the house expands or contracts or settles a little bit the polyurethane will stretch with the house. Be aware, if you visit Fauxpanels.com, that they offer multiple families of panels to choose from. Most of these are polyurethane, but they sell a few polystyrene and vinyl products. I believe these are their older lines. These are cheaper, but what you want is the polyurethane. The others expand and contract just like vinyl siding. Bad choice. The specifications for the product indicate that the product has near zero UV degradation. UV degradation is the deterioration of plastic over time from exposure to sunlight. The Fauxpanels.com products (and most of their competitors) will indeed last decades, but understand that near zero is not the same as zero. If you are comparing it to another plastic siding then what Fauxpanels.com offers is better. If you are comparing to real bricks and real rocks, the comparison isn’t as good. At least in terms of UV degradation real materials are the clear winner. And the faux panels will deteriorate if the painted exterior is damaged. If tree branches rub the paint off, and the exposed polyurethane receives a lot of direct sunlight over years, then there will be some deterioration in that one area. Some faux panels may also suffer from insect penetration. Not that the insects eat the polyurethane, but it can make a great nesting material. Fauxpanels.com treats their product to prevent this. Most of the other manufacturers do also, but confirm this before you buy. Where faux panels have the advantage is in resistance to freeze damage. Bricks and stone will allow some water to penetrate and if that water freezes is can crack the brick, the stone or the mortar. Obviously this is not a serious problem, otherwise our old masonry buildings what have been reduced to dust years ago. It is, however, a possibility that some minor damage may occur. With faux panels some water may penetrate between the panels, but any that gets behind the panels will do little damage to the panels, since they are elastomeric. A little stretching will not damage them. Some faux panels are fire rated. This means that they have been treated to resist spreading flames should they get exposed to fire. It is not the same as fireproof, but you could use these in situations where that might be a concern, such as around fireplaces. However, at least from the panels from Fauxpanels.com, the fire rated panels are not suitable for outdoors. You can use normal panels on chimneys. They will not be subject to flames unless there is a chimney fire, in which case you are already in serious trouble. Personally, I would be cautious about using polyurethane around the opening of a fireplace. Unless there is enough space to ensure that they will never be exposed to flame I would go with a brick veneer. The fire rated panels may not be highly flammable, but they will give off nasty gases and might seriously add to the damage, or even create a serious smoke hazard. Be safe. Real bricks will not burn, and they won’t give off gases. If you aren’t willing to use wood in that location, don’t use polyurethane. My final complaint about faux panels, is that the don't offer any brick patterns with other than your standard running bond. If you have followed my other articles on brick walls you would know what I am talking about. (Hint: click on the link and read my other articles!). Well, maybe some company offers such a panel, but I haven't found it yet. So what will faux panels cost? You can go to the various websites to get the real pricing, but the sites I looked at had prices in the range of $8 to $11 a square foot (as of April of 2012). That cost does not include the wrap, and drainage mat, and mortar and glue and screws and the corner columns. Nor does it include any OSB (wood panels)if you need to build up a flat surface before applying the panels. As an alternative, consider brick veneer siding. It may well be priced competitively to the faux panels, even if professionally installed. By way of comparison, vinyl siding will set you back about $4 to $6 a square foot. But then you won’t have a brick house.